The Tischbeins were already famous in Germany when little Johann was born. The child represented the fourth generation of a family of artists. Of course, his teachers were the members of his family, it is, his father and his grandfather. Despite the rococo influence he received from his predecessors, Johann, like many others of that time, turned his style towards neoclassicism, movement which judged rococo as vain and superficial. In his second trip to Rome, he meets the writer Johann Wolfgang von Goethe. They became friends and had a good relation throughout their lives. 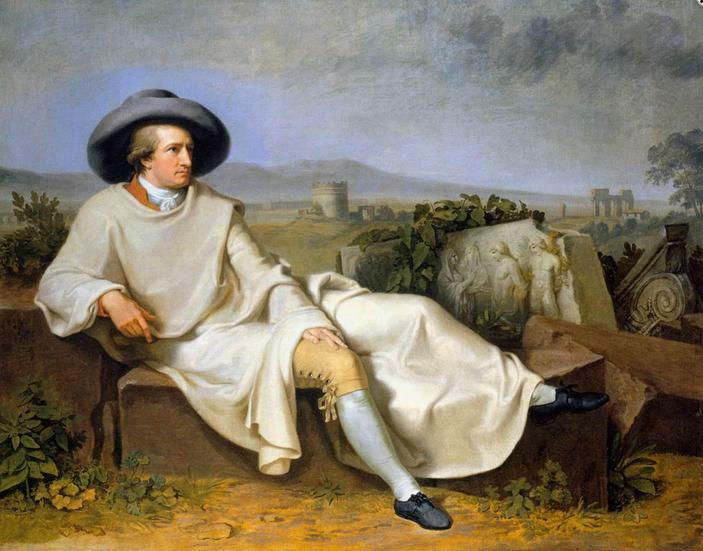 Goethe in the Campagna shows the writer posing over some ruins in the outskirts of Rome. This is probably the only portrait in which we can see Goethe relaxed and informal. The work has minimum technical mistakes: on one hand, the illumination seems artificial: in the foreground, all the elements are clearly lighten but, if we look at the background, we will notice that, at the same time, it is cloudy and dark; on the other hand, the feet of the main character seem too small and his hands too big. But, if there is something very curious in this painting, is the inner conflict of the artist between the rococo and neoclassicism. Let me explain myself: one of the main motifs in rococo painting was the portrait of aristocrats in their spare time, the same motif we can see in Goethe in the Campagna. However, in the same painting we will find elements which are typically neoclassic. If we have in mind that neoclassicism was a reformulation of the classical art of ancients Greece and Rome (etymologically evident); we may see that in Goethe in the Campagna, the kind of drawing, as well as the modest clothing of the writer, refer directly to this movement. As it wasn’t enough, Tischbein forces roughly his intention to be recognized as neoclassic, adding the composition some ancient ruins and figures from previous civilizations in relief. We get it, Johann. This is the only painting from the artist which is mildly known. Its influence allowed everyone, until today, to know Johann as “Goethe-Tischbein”. ~ by Álvaro Mazzino on May 13, 2011. DxOMark has reportedly rated the Sony Xperia Z5 as the device that produces best mobile photo and video. The scores are 88 and 86 points for photo and video, respectively. Additional pops of red can also be seen on the inner liner, Wings logo on the ankle, Nike Air on the tongue, and the rubber outsole. Don’t miss out and cop your pair this Saturday, May 6th at select Jordan Brand retailers for $160. Packed full of rare gems, and hard-to-cop silhouettes, this week’s roundup promises to leave you both jealous and wanting to step your shoe game up even more. This entry was posted on May 13, 2011 at 16:31 and is filed under Neoclasicism.You can follow any responses to this entry through the RSS 2.0 feed.You can leave a response, or trackback from your own site.